If there’s one thing we’ve learned, it’s that the Vegas Golden Knights read The Bloggers’ Tribune. Just days after announcing that the Chicago Wolves would be the AHL affiliate of the Golden Knights, the Wolves sign Tyler Wong…coincidence? Yeah probably but we can pretend it was all because of us. So I figure, why not help out the expansion NHL franchise again. This time it’s Alex Barré-Boulet of the Blainville-Boisbriand Armada in the QMJHL that should be a target of Vegas. Barré-Boulet turns 20 this weekend, and what better way to celebrate than with a professional hockey contract. He just finished his third season in the Q – one in which he got traded from Drummondville to the Armada at the deadline in order to make a run at the Memorial Cup. They came up short, but Barré-Boulet had 12 goals and 33 points in 28 games and provided a secondary scoring punch that was much needed. When the trade really paid off though was in the playoffs. Finishing second in playoff scoring behind Mathieu Joseph, Barré-Boulet had 31 points in only 20 games and seemed to take his game to the next level. This was the second season in which Barré-Boulet had a very nice offensive output. He is a good puck handler who shows good creativity and vision. He is an above average skater who likes to have the puck on his stick. He was even able to play the point on the powerplay for Drummondville. Passed over in two straight drafts – likely because of his size – Barré-Boulet is a player that likes to get physical and play with a little edge. A comparison to Brendan Gallagher’s style of play isn’t totally off-base, though Barré-Boulet isn’t nearly that good. 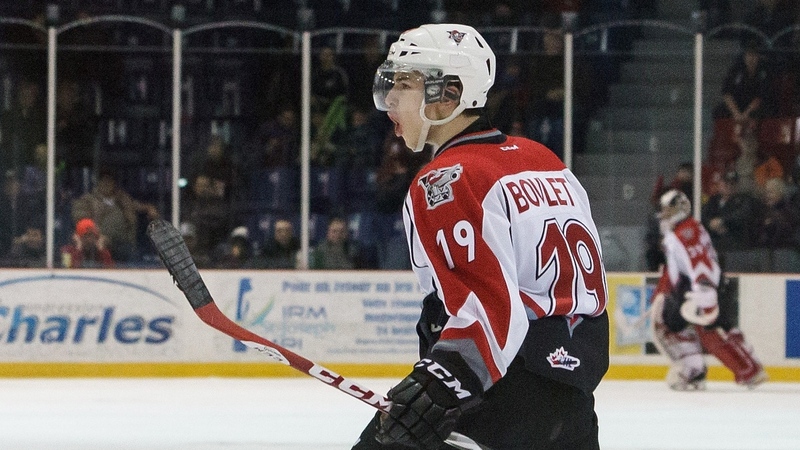 Now I’m not suggesting that Barré-Boulet going to be an NHL, or even that he’s going to be at all outside of the QMJHL – but when you’re a team building from the ground up, risk-free assets are always worth taking a look at. The Vegas Golden Knights are going to be forced to fill out nearly two full rosters next season. With the signings of Wong and Reid Duke, they’ve shown that they’re not afraid to take a gamble with CHL free agents. Bringing in Alex Barré-Boulet would be a good next step.